Today is the day. In a few hours I’ll be at the London Book Fair, which lasts for three days. I’ve been looking forward to this for a long time. And now it’s here! I’ll be crazy busy over the next three days. In other book news I finally purchased a Kindle Fire. I haven’t had much time to play with it, but so far I’m super impressed. And one last bit of book news, I broke my book buying ban. Last week I purchased three books. However, all three of them are gifts so I may not count it. It’s safe to assume that if you are friends with me gifts will involve books. However, it was a thrill to shop for books and I wonder if this act will break me completely. I miss bookstores! I’ll do my best to share what I learn and experience at the fair. I hope everyone has a wonderful three days. 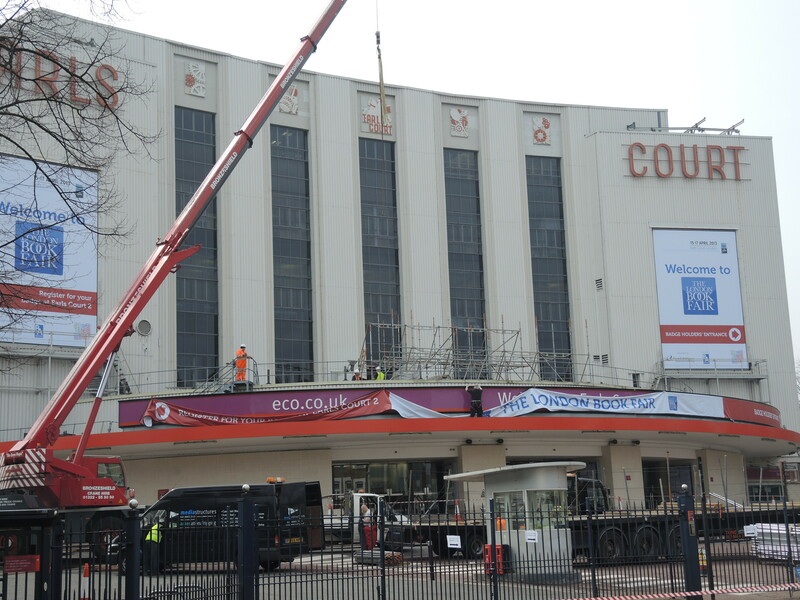 Last week they started the setup at Earl’s Court Exhibition Centre. This entry was posted in Books, Life, London and tagged 50 Year Project, Blog, Blogging, Book Fairs, Book News, Books, Earl's Court Exhibition Centre, England, Kindle Fire, Life, London, London Book Fair, Photography. Bookmark the permalink. 34 Responses to The Book Fair is Here! A book fair is a fabulous thing indeed. And you are right, bookstores often had that same heady hit of new books waiting to be picked up to sweep the reader away. Can’t wait to see the pics and picks! Oh, how I wish I was there so that I could go to the Book Fair with you!! It sounds wonderful, and I’m excited for you :). Now, as for your Kindle Fire – YAYYYYYYY!!!!! As I think I’ve told you before, I know a website where you can get all of your books for free and also a free software program to convert the books to the MOBI format that Kindle uses. If you want, I can tell you all about it. Let me know. You would love the fair. I know you would! After Wednesday I’ll shoot you an email and we can chit chat about MOBI files and all that hoopla. Woohoo! Sounds good :). By the way, are all your friends and family ok in Boston? Believe it or not, that was my first waking thought this morning because it all of a sudden dawned on me that you’re from there. Sick, messed up people in this world I tell you!!! I know someone who was actually supposed to be running, and his wife usually stands right where it happened!! The only reason they weren’t there this year was because he had hip problems and couldn’t run! It was the first time in 20 years he wasn’t in the marathon. Thank goodness! I sent out emails when I heard and so far no one I know was injured in the blast. Some friends were a block away, but escaped unharmed (at least physically). How lucky for your friend and his wife. I do hope that his hip is okay though. Things like this shouldn’t happen. It makes no sense to me. Patriot’s day is supposed to be fun: history, the marathon, Red Sox–now they are beefing up the security for the London marathon that occurs this Sunday. I hate violence and I will never understand it. Thanks for thinking of me and of my friends. How exciting !!! 3 whole days of book wonderment!!!!! Amazing…..
Books always make the most amazing gifts. Every book I got has a time stamp that tells me the date and occasion for which I got it. that’s great that you do that. I wish I started that project years ago. How much do you think you’ll not be spending there?! Have a wonderful time honey! Looking forward to your pictures of the book fair. We really don’t have anything like that here in New Mexico. Certainly nothing that needs setup the week before. this fair is massive. I’m really impressed so far. Looking forward, very much, to your feedback from this. If I can’t be there I can live vicariously! I’ll do my best to report. I was wondering about your book ban, but then you answered the question for me shortly after in the next sentence. I wouldn’t be surprised if you went home with a few new books! It’s hard resisting them. It really is! They do a lot of talks and presentations at this one. I’ve been enjoying the author talks so far. I’ve heard so much about this fair and I’m looking forward to hearing what you learned! How are you enjoying your Kindle Fire, now that you’ve had a few more days to “play” with it? I ask, because I read a review/customer comment somewhere on one of the literary blogs (alas, I can’t remember which one) which really panned it and recommended NOT buying it. So I’d be interested to know what you think of it. I’m really enjoying it. I should state that I’m not a very techy person so I don’t push it to the limits. I’ve only read books on it and accessed my lovefilm account and email. I know some who want it to be more like a tablet are disappointed. I was looking for a ereader so I’m happy with the extra perks. I think it really depends on what you are looking for and how advanced you want it to be.